The traditional mechanically sealed pump has long been the go-to for just about every application in mining facilities. While in most applications sealed pumps are an economical and suitable solution they may not be the best alternative in critical processes especially chemical handling. The combination of seal failure due to shaft movement, heat generation and chemical attack can lead to expensive downtime as well as possible human and environmental concerns. When considering such chemical processes such as acids, tank farms and leaching pads there are a variety of sealless pump choices. Sealless pump technology has improved greatly over the past decade. Advances in materials coupled with cost reductions to rare earth magnets have made sealless pumps an economical and viable solution to tough chemical handling applications. Mechanically sealed pump typically carry a lower initial cost than sealless pumps. If you consider the Life Cycle Cost (LCC) of the pump the initial cost is typically less than 20% of the pumps cost over its life. 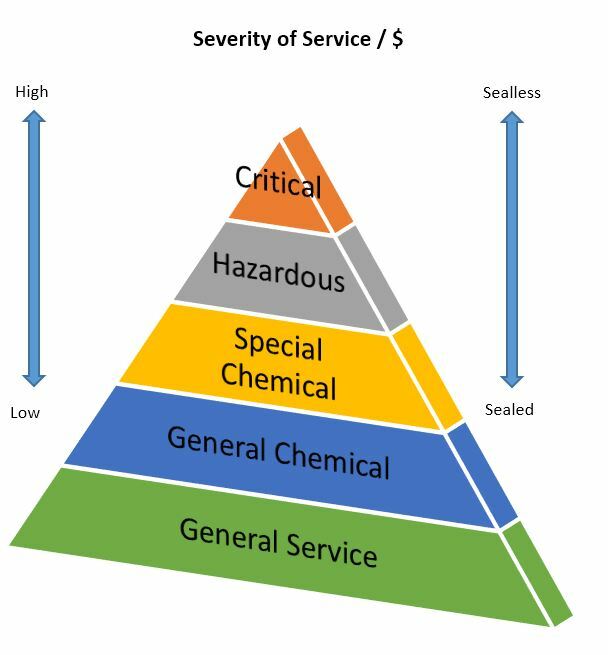 Factors such as energy and disposal costs are equal when considering LCC whether it is sealed or sealless. But factors such as maintenance along with the downtime and environmental costs associated with maintenance and seal leakage can equal as much as 50% of the pumps costs over its life. 50%! The number one reason a pump is sent to the shop is for a leaking mechanical seal. The three major reasons a mechanical seal will leak are 1) open seal faces, 2) heat generation and 3) chemical attack. Open Seal Face: The major contributors to a seal face opening are shaft movement. This can be either axial, radial or due to vibration. Axial movement is usually associated with varying pump operation during start up, shut down or the opening/closing of valves. It can also be associated with temperature changes during process cycles or batches. Sealless pumps utilize high strength magnets coupled with thrust surfaces designed for varying pump operation. They also utilize materials specially designed for varying temperatures. Radial movement is associated with end play or shaft deflection when the pump runs past its best efficiency point. It is also found when bearing frames wear and shaft deflection occurs. Sealless pumps are designed for full curve operation typically utilizing dual thrust surfaces and many sealless pumps are close coupled eliminating any fears of shaft deflection. Vibration is usually found during cavitation periods when NPSHa is low or the pump is vortexing fluid from a supply tank. Sealless pumps typically utilizing dual thrust surfaces designed to handle moderate cavitation. Heat Generation: Heat generation is typically associated with dry run conditions or prolonged cavitation. Heat generation can cause damage to the seals faces and elastomers causing them to fail as well as degrade lower grade seal materials. Many sealless pumps have dry run sensors built into or around the pump to alert operators of such a condition. Some manufacturer’s designs even have patented bearings that utilize materials to withstand dry run conditions. Almost all sealless pumps have dual thrust surfaces designed to handle moderate cavitation. Chemical Environment: Many fluids crystallize when exposed to air or heat from mechanical seals. Some examples are caustics, sea water, brine, hydrocarbons and sugars. Sealless pumps have no contact with air. A chemical environment can also promote corrosion. Some corrosive chemical examples are acids attacking carbon seal faces, chlorides attacking stainless steel faces and metal finishing chemicals corroding metal bellows/set screws & plated seal faces. Sealless pumps come in a variety of high alloy metallic and non-metallic materials designed especially for chemical applications. While mechanically sealed pumps have their purpose in many mining applications sometimes utilizing a sealless pump will eliminate downtime and lower maintenance costs.